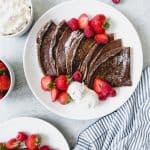 Enjoy these easy Chocolate Crepes for breakfast, brunch or dessert and turn any day into a special one. Fill them any way you like with whipped cream, fresh fruit, nutella, jam, cookie butter, or just simply dusted with powdered sugar! Add the eggs, water, milk, flour, cocoa powder, sugar, salt, and vanilla to a blender and process until smooth. Add the butter and blend again for a few seconds. Let the batter rest for 15 minutes. Preheat crepe pan. Pour 1/3 cup of batter into pan and swirl. Cook for about 1 minute on medium heat until the surface of the crepe looks dry, then flip and cook for another 15-30 seconds, then transfer to a plate. Repeat with remaining batter, stacking the crepes on top of each other.